When you build an email list of subscribers, you can use this as a tool to generate sales. Many gurus describe mailing lists as the single most important tool available to digital marketers. They tout building a relationship this way, then you’ll have an almost guaranteed market for your products – as long as they’re good. How do you go about building a list of subscribers? And how do you keep them? To share this image on your site, please copy and paste the code below. Autoresponders are services like Aweber, MailChimp and GetResponse, which help you to manage your subscribers and send out confirmation e-mails etc. These are also what will allow you to create sign up forms that will look the part on your website. Please do NOT use your personal email service (like a Gmail, Hotmail, Yahoo, etc.) to send out email marketing messages to your list. You’ll look like a newbie, and this will kill your credibility. There are lots of places you can add a sign-up forms. One option is simply to put them on your website in one of the side columns or even at the bottom of each article. Alternatively you can create a whole landing page designed specifically to drive conversions and sign-ups and you can then use PPC campaigns, SEO and social media to drive traffic to that page. Popups are also very popular (no pun intended) at the moment. These are windows that appear over the top of your content when readers have been on the page for a certain amount of time. These have been shown to drastically increase subscriptions. Just make sure you’re not frustrating your readers and causing them to leave. Pay special attention to the user experience on mobile! An incentive can make a big difference in encouraging people to sign up to your mailing list. A common incentive is a free report or even just a chapter of an ebook that people will potentially buy later on. Visitors love getting things for free, and this will seem like a much fairer exchange than just getting them to give you their contact details without an immediate reward. If you blog, then simply talking about your mailing list in your posts can be a good strategy do. Don’t set up your form and then forget about it – treat it as an integral aspect of your business and talk about why people should sign up and what exciting content they’ll receive if they do! Once you start building a list of subscribers, you will want to keep them! because they forgot they ever signed up due to the lack of emails and so many other emails. 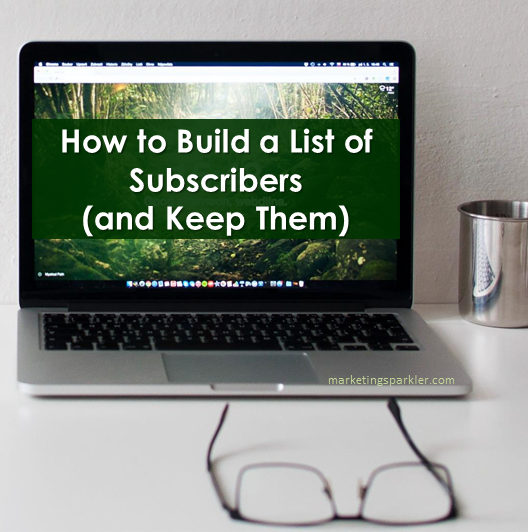 Now that you understand how to build a list of subscribers (and keep them), use these nine tips to help you avoid all these situations, so your list building efforts don’t go to waste. Before you attempt to get one subscribe, ensure that you’re attracting the right people to your email list. Having just anyone sign up won’t help you reach your goals. Ensure that the content you put out there to attract people to sign up is directed to your target audience, and no one else. Also ensure that any freebies you give out in exchange for email addresses are things that only your target audience would want. Make sure your optin offer will attract the right audience to help you reach your goals. Once they are on your email list, it’s important that you use the technology within your autoresponder software to personalize the subject lines for your audience. If they see their name within the subject line, they’re going to be a lot more likely to open it and notice it in the deluge of email they already receive. Your autoresponder software also has the ability to personalize the inside contents within the email. Use it. It’s important to use this capability because audiences respond very well to having content personalized to them. They see their name and they feel more important and more like clicking through. Do not bait and switch your audience. Deliver on your promise and email them content they expect. In addition to being targeted, the content needs a purpose. Your purpose can be multi-fold. You want to inform, entertain, educate and engage. You may not do every single one of these – though that should be your goal – but at least choose one of these. Plus, include your call to action, every single time. One of the most important things you’ll want to impart to your audience is your willingness and desire to help them achieve something or solve their problems. Since what you offer them does solve their problems, you are on the right track by offering them your products or services. Email your list with helpful information. Do not send emails just for the sake of sending them. Be careful about sending content too often. You know the people who send content three or four times a day; it is irritating and even if they do offer something good you stop reading. You get sick of it and just don’t read and eventually you unsubscribe. You don’t want that to happen so tread carefully here. Conversely, it’s important to avoid not sending content to your audience enough. Before the first person signs up, you can have your autoresponder filled with enough content to go out at least for one year, which equals out to one piece of content a week. That’s 52 evergreen pieces of content! That content should fit your audience and promote the products you have now and know you’ll have for a long time. Then you can add fresh content to go out once or twice a week that is new, if you choose to. Now back to the real world: That sounds damn near impossible doesn’t it? Don’t worry, it IS DOABLE if you map out your content and products you want to sell in advance. If you don’t have enough content to fill out a yearly calendar, don’t worry. Get started with 2-3 weeks and grow from there. Finally, it’s really important that you study your metrics. If you don’t know who is opening, how many are opening, when they’re opening and what happens when they click through to follow your call to action, then you won’t know if what you’re doing works or not. When you put forth the effort to build an email list, it should be function as a part of your sales strategy. You need to know if your work is really producing a response. Creating subscriber-friendly content is simple if you have done the work to understand who your audience is AND what they want. You can even use your autoresponder software to engage your members and ask them what they want. The more you can deliver what they want, the more successful you’ll be. I agree with you in order to build a list of subscribers and keep them your blog,it must be well presented and worth to read. Absolutely Richard. Content must provide value to readers or they’ll quickly move on. Thanks for commenting! Attracting more subscribers is a great help to earn money and to communicate with bloggers and readers. I agree Erik. The “money is in the list” is cliche but it’s true. Thanks for stopping by!